Constant Content is a very popular article marketplace! Freelance writers can earn money there and bloggers (like myself) can purchase high-quality content there on days when they don't quite feel like writing. 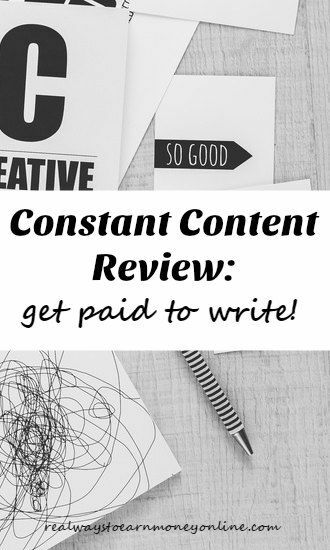 In this Constant Content review, you'll find out how this site works a bit differently than many of the other freelance writing sites I have listed. But, many writers find it is very much worth their while. I'll also share with you a few first-hand accounts of writers who have had some success selling content through this website. In order to begin writing and sell your articles here, you'll have to first take a short grammar test. If you pass their test (which is really fairly simple) Constant Content will accept you into their pool of writers. You can choose to either answer calls for content or you can publish your own content and set your desired price for it. What you submit is up to you, but it has to be of good quality. Constant Content editors will look your submissions over carefully and ask you to revise anything that doesn't meet their high-quality standards. What Are the Options to Sell Your Articles Here? When you sell an article here, you can list it three different ways. Your options are usage, unique, and full rights. When someone buys your article for usage, they publish it as is and are technically not supposed to make changes to it since you still own that content. Articles can be sold for usage multiple times, so this can be great passive income. Unique rights is similar to the usage option, except that the article doesn't remain in Constant Content's database to be sold again. When you sell an article for full rights, you are basically selling your article completely. The purchaser can edit your article and resell it if they choose to do so. It will also disappear from the Constant Content database. Usage is the only option that allows you to sell the same article over and over. Which Selling Option on Constant Content Is Best? You get the highest price for full rights and the lowest for usage. Constant Content takes 35% commission off your earnings, so that's important to keep in mind when you set your prices. Pricing your content isn't an exact science, and it's helpful to go by what other authors are doing. They also have some helpful guidelines on their site showing you the recommended prices depending on your word count. Articles over 1000 words can get over $100 for full rights! Does Constant Content Have a Referral Program? Constant Content has a referral program. If someone signs up using your referral link, you'll get a 5 percent commission of their sales. My personal Constant Content review unfortunately is lacking in details. I wish I had more to share! I have only dabbled in this site a little bit, but I love the concept. I tested the waters and posted some things, but they never sold and I ultimately took them down. But I can't honestly say I really gave it a good go and focused on it like I should have. What Do Others Say About Using Content Content to Sell Articles? Many people really enjoy this site, and claim to do well there. In this Constant Content review, Courtney Herz says she likes the site, consistently sells articles there, and has 8 tips for you here. Adam at Writing From A to Z claims to have written 51 articles there and sold 31 of those. What I'm gathering is that, in order to do well with Constant Content, you need to have a lot of content available for sale on their site. The more you have up, the more you are likely to sell. Constant Content is not for me, but that doesn't mean it isn't for you! I think that if you want to sell your articles here, it's ultimately a better option than writing for Textbroker and sites like it. In most cases you're going to earn more for your work. Getting $100 for an article on Textbroker is just almost never going to happen, but it's a real possibility with Constant Content. Still, if you're the impatient type, you might do as I did and decide you just can't wait it out to see if stuff starts selling. How to Sign Up to Write For Constant Content? So you read this Constant Content review and decided you want to give it a go? Go here to register at Constant Content as a writer. Want to Go Into Business For Yourself? Here's a Free List For You! This is the most profitable route to take as a freelance writer. You can get your own clients and set your own rates, which you cannot really do with other content sites. A six-figure income is not outside the realm of possibility when you're running your own business. I really enjoy your blog but when I try to pin or follow you on Pinterest, it keeps saying I can’t because you’ve blocked me. I really do enjoy your work at home ideas, but because of this issue I can’t save them for references. Can you please help me? Hi Deborah, I’m so sorry! I don’t recall blocking you, although I do often have to block people for spamming. But I don’t recall blocking you. What is your Pinterest account URL? It may have been done in error. If you can give me the link to your Pinterest profile, I can check on this and unblock you if you are blocked. Thanks.